Piedmont – Food Glorious Food! Food Glorious Food! Wine Wonderful Wine! A three night whistle stop tour of Piedmont was certainly not long enough to take in such a beautiful place. It’s a good job Headwater offer eight night options for both walking and cycling holidays to really get under the skin of this region and sample its delights. We left the hustle and bustle of Milan Malpensa airport behind as we headed off to the tranquil and off the beaten track region of Piedmont. During the 90 minute drive we passed many vineyards and pretty hill top villages. I felt very excited as I just knew we were in for a truly wonderful time. The windy steep road up to Villa Beccaris, our accommodation for the first evening, gave us an insight as to what my bike and I would have to handle the next day! My first impression of the Villa Beccaris was that is a lovely, very warm and welcoming place to be. As I walked through the villas’ many corridors my eyes were wandering all over the place at the beautiful Italian décor. 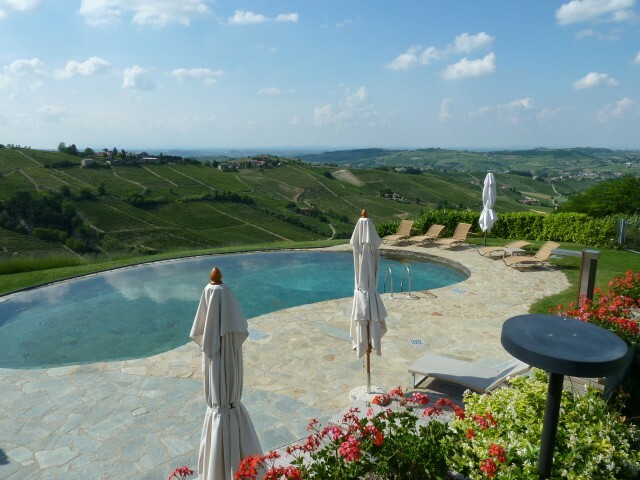 Villa Beccaris is in the heart of Monforte d’Alba and is split into three different buildings. Our room was very traditional and comfortable with all the modern features and luxuries of home such as dressing gowns, slippers and fluffy white towels. An outdoor seating area provided a lovely setting for taking in the great views. After settling in, a very short stroll along the cobbles of Monforte d’Alba took us to a local gastronomic restaurant called Moda where we would have our evening meal. All I can say is WOW! It’s a very stylish and modern restaurant with outdoor dining overlooking the rolling hills and vineyards. It offers wonderful cuisine which will delight your taste buds. Antipasti ; tortino di zucca e porri, primi piatti; tajarin con ragu di salsiccia, secondi piatti; maialino da latte glassato, dolce; tarte tatin. 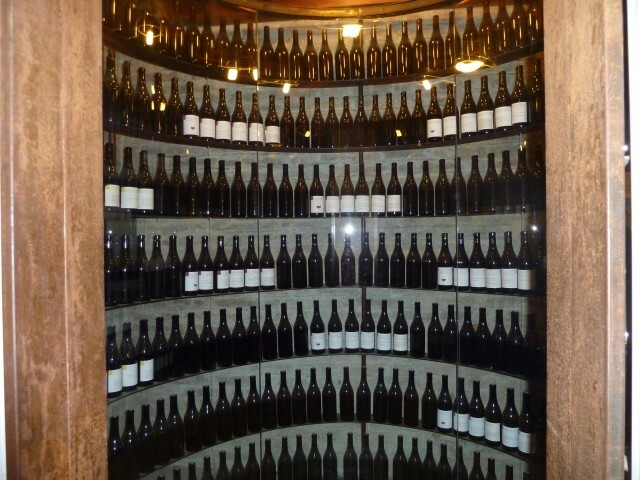 All with a wide selection of delicious wines to choose from which were displayed in the very stylish wine cabinets. Frank Sinatra music played in the back ground and the low lighting contributed to the very relaxed and romantic ambiance. After the delicious evening meal it was time to retire to our comfortable bed at the beautiful Villa Beccaris. With breakfast digested it was time to get in cycling mode (Monforte d’Alba to Benevello) and work off some of the meal from the previous evening. A wonderful downhill whiz gave me the greatest feeling of freedom but I knew that with each of these downs there would certainly be an up! We cycled along quiet tarmac roads and saw more people on bikes than we did in a car. The 12km cycle to Benevello was via villages, vineyards and farms and very peaceful. We saw one or two locals, one of whom was kind enough to refill our water bottles which goes to show the friendliness of the locals in this region. We began the steep climb up to Benevello and it was worth every minute. We were faced with a beautiful square and church and the most wonderful panoramic views. I could see in the distance the beautiful pink villa that was our next stop, Relais Villa d’Amelia which we soon reached. On arrival, we received a very warm greeting from the staff and a small glass of sparkling wine. After cycling all day in the warm sunshine this was very much needed as was a dip in the pool. We were surrounded by stunning panoramic views. We enjoyed some time relaxing in our very spacious bedroom before heading down to the piano bar for a pre-dinner Moscato. Our evening meal was most welcome after our day of cycling and you couldn’t get much better than a Michelin starred restaurant. This was a real highlight of our trip! There were so many decisions to make as to what to sample from the a la carte, four course menu; the cuisine is based on Piedmontese culinary tradition with great attention to detail and only the finest locally sourced products. I finally managed to make some choices and my delicious dinner was comprised of raw chopped ‘Fassona’ veal meat with corn salad and shaved parmesan to start, pea and mint risotto decorated with beautiful edible flowers as my first course, roasted lamb with crunchy seasonal vegetables as my second course and finally a very small helping of ice cream (as requested) for dessert. It was such a fantastic experience and the wine list was the largest wine list I have ever seen with prices ranging from 30 euros to 590 euros (I don’t think my line manager would have signed off on expenses a bottle of 1993 Conterno GiacomoMonfortino). With a full stomach, tired legs and bronzed arms, all signs of a great day, it was time to retire for the night. After a perfect night’s sleep, a delightful breakfast (oh yes we found some room), it was time for a short taxi ride to the beginning of our walk alongside the waters of the Tanaro river onto Roddi. It was a very varied walk, from walking in the forest and through vines to then passing through Roddi where we had a refreshing drink overlooking the castle that used to house the University of Truffle Hounds. Rolling hills and hilltop villages surrounded us as we made our way through more vines. We had been pre warned that the last twenty minutes of the walk was quite a steep climb up to Grinzane Cavour so we stopped to enjoy a light lunch washed down with a local sparkling wine. The Italian bar had a wonderful ambience and as all the locals gathered for a very sociable lunch break, we ended up sitting for much longer than anticipated, people watching and listening in to conversations. Onwards and upwards to Grinzane Cavour for the final ascent and once again it was well worth it. We were greeted with the wonderful megalithic castle and picturesque panoramic views. The castle is home to the Cavour Regional Enoteca. It is a prestigious showcase for the very finest Piedmontese wines and grappa’s, with pride of place being reserved for Barolo and Barbesco wines. Guided tastings can be arranged and we would definitely recommend a visit to the museum which displays lots of memorabilia relating to local food and wine traditions at just five euros per person for entry. It is well worth a visit. 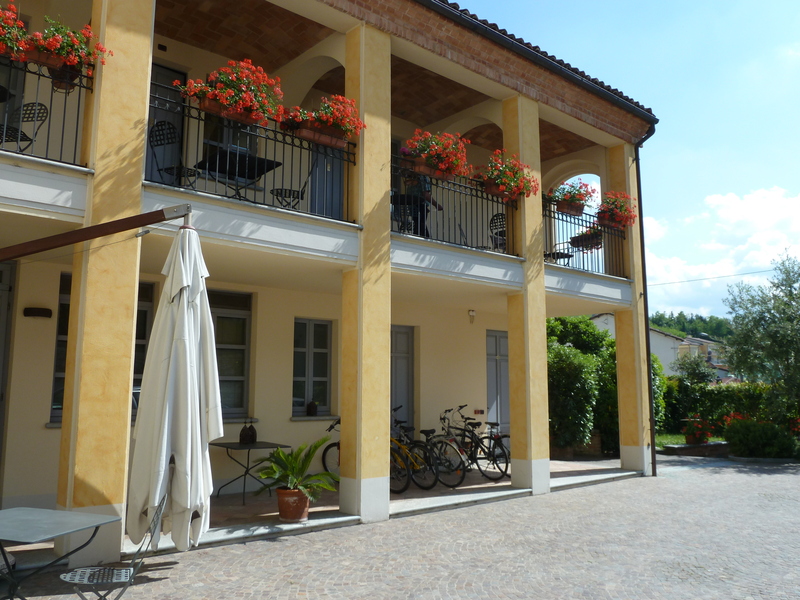 Casa Pavesi in Grinzane Cavour is a beautifully restored town house at the foot of the castle. We received a very warm welcome from the lovely owner Paola (who is incredibly proud of her wine cellar) and shown to our room; a very elegant room, charmingly decorated and full of character, just like the owner. A quick freshen up as our local reps had organised for us to dine at Le Torri Hotel. The perfect table had been reserved for us overlooking the vineyards of La Morra, Roddi and Verduno. Another four courses and a bottle of wine later whilst the sun was setting and it was time to retire to bed before our early morning journey back to reality. Having worked at Headwater for 16 years I was always under the impression that the Castell d’Emporda in Catalunya was the jewel in the Headwater crown, however I have now been lucky enough to visit several other jewels in the Headwater crown during my wonderful visit to Piedmont. I simply cannot wait to return one day and sample a 2014 Barolo, this year is a great year for wine! If you fancy following in Kerry’s footsteps and heading to Piedmont, get in touch with us now on 01606 822497 or email us at sales@headwater.com. Kerry has a real love of travel and especially loves visiting the islands of the Med. Her all time favourite is Cyprus - where she was engaged and married. When she's not island hopping she enjoys spending time with her family, going walking and cycling, meeting up with friends... or simply relaxing with a good 'chick flick' book.